With the amount of online presence that we have today, it is extremely easy for stalkers to use the Internet to stalk you. Cyberstalking sure is a sad and creepy part of modern society. Let’s take a closer look at how to recognize it, prevent it, and what to do if you find yourself on a creeper’s radar. In the real world, stalking definition is unwanted obsessive attention to a specific person. Physical stalking can get forms of following, secretly watching, persistent calling and texting to manipulate, and finding other means to approach the victim unexpectedly. Now let’s turn to the digital world. Cyber stalkers are driven by the same intention – to embarrass, threaten, or harass their victims. The difference is, they rely on online technology to do it. Email, social networks, instant messaging, personal data available online – everything on the Internet can be used by cyberstalkers to make inappropriate contact with their victims. But don’t confuse cyberstalking with social media stalking. ‘Doing research’ on your newly hired colleague by exploring his or her Facebook profile and Instagram feed is rather innocent. Keeping an eye on someone’s activity on social media is simply getting insights into one’s life without giving anything in return. 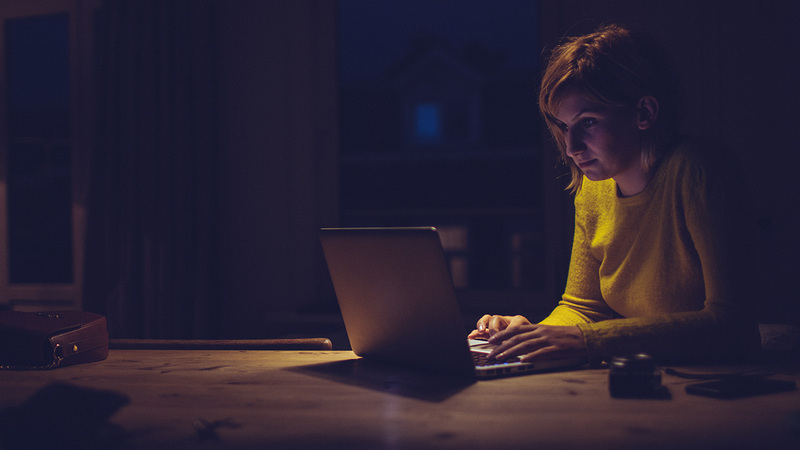 Cyberstalking is way more serious as it involves nefarious intentions, ranging from false accusations and defamation to sexual harassment and even encouraging others to harass the victim. In many cases, physical and cyber stalking interconnects, making it even more threatening. NOTE: Cyberstalking and cyberbullying overlap in many places. If you’re looking for tips on how to identify and prevent cyberbullying, click here. Catfishing occurs on social media sites, such as Facebook, when online stalkers create fake user profiles and approach their victims as a friend of a friend or expressing romantic interest. To look more like a real person, cyberstalkers sometimes copy profiles of existing users, impersonating their identity. Take a look at the friend’s list. Catfishers rarely have more than 100 friends. Save the profile picture and run a reverse image search on Google. If you get links to multiple profiles, it’s a warning sign of an imposter. Review user’s photos. If there are only selfies, single-person shots or stock-style pictures, it is likely they aren’t real. Suggest to make a video call and see how the person reacts. If he or she starts making excuses, you can suspect that you’re talking to a catfisher. If you’re adding location check-ins to your Facebook and Instagram posts, you’re making it super easy for a cyber stalker to track you by simply scrolling through your social media profiles. When combined together, location-tagged posts can indicate your behavior patterns quite accurately. If cyberstalkers get to know their victim’s home address, all they have to do is open Google Maps and type it in. By using the Street View, they can see exactly how the house looks without even stepping into the victim’s neighborhood and drawing attention. Also, cyberstalkers can virtually research the environment: surrounding houses, cameras, and alleys, to get a sense about the neighbors. Hijacking a computer’s webcam is one of the creepiest methods cyberstalkers use to invade victim’s privacy. Creepers would try to trick you into downloading and installing a malware-infected file that would grant them access to your webcam. The process is so sneaky that it’s likely you wouldn’t suspect anything strange. If just the thought about someone secretly watching you through your webcam gives you shivers, read how you can tell if your camera has been hacked. Internet stalkers love geotags – and for a good reason. Every digital picture you take may contain geotags, which are pieces of metadata revealing the location of where and when the photo was taken. Geotags come in the EXIF format, which is embedded into an image file and can be extracted and viewed with the help of special apps. This way, a cyberstalker can learn about your whereabouts. These are just a few of the tricks creepers use, and in fact, they can get very creative. Let’s look at what you can do to protect yourself from cyberstalkers. Review your privacy settings on social media sites. Since these are the places where cyberstalkers can easily snoop on their victims, make sure that you’re not oversharing. If possible, adjust your settings so only people from your friends’ list could see your photos, updates and personal info. Feeling tempted to tag the location of that really cool coffee place you’re at? Try to stop yourself. Also, you can go a step further and turn off geotagging so that no location-disclosing metadata would be added to your photo files. Facebook events are great for planning, but they can also be the worst in terms of privacy. When appearing in the feed, they can show your stalker where and when to find you, as well as indicate your interests. Set strong and unique passwords for your online accounts. Also, enable two-factor authentication (2FA) where possible to get an extra layer of security. Cyberstalkers can exploit the low security of public Wi-Fi networks to snoop on your online activity. Therefore, avoid sending private emails or sharing your sensitive information when connected to an unsecured public Wi-Fi. Or, use VPN service, such as NordVPN, which will encrypt your online activity and protect your private data from unwanted snoopers. Check how much information one can find about you online, or, in other words, check your “googleability”. If you see that there’s too much a cyberstalker would find out about you by simply running a search on Google, try to take some information down. If you’re being attacked by a cyberstalker through email, messaging apps, or any other electronic means, keep the records. Save copies and take screenshots as evidence. Do cyber stalkers violate any laws? As cyberstalking is a form of emotional assault, laws governing harassment and slander can be applied to electronic communications. However, this practice is often problematic because confrontations in cyberspace are different from real-life situations. While some countries apply older laws, others have enacted specific cyberstalking laws. These laws are relatively new and arguably still have room for improvement. For more tips on staying safe, secure and private, subscribe to our monthly blog newsletter below! Elle is a content writer at NordVPN. Being ever-curious, she always finds unexpected angles in the internet privacy and security field to turn into gripping stories.